Adam Lewis is a living legend, and as such, the only legend on the JQRacing Team. Adam first met JQ back in 2007 in Norway, just as JQ was thinking about starting his car project. Even since then Adam has made fun of JQ whenever he could. But in a nice way. 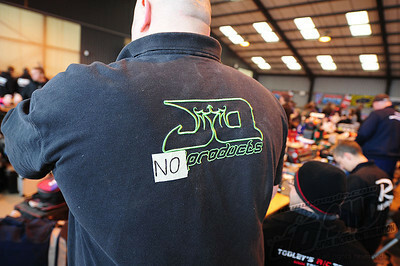 He has been the biggest JQProducts, and now JQRacing billboard over the years, due to his incredible T-Shirt size. One of the most legendary stories involving "Showtime", took place at an indoor 1:10th race, where there was a huge tabletop right in front of the rostrum. Adam misjudged the jump on one lap, and jumped directly towards himself on the stand. Without hesitating, he smacked the car mid-flight with his right hand, downsided the jump perfectly, and kept on going. The crowd erupted in cheers. Yes, when Adam "Showtime" Lewis is on the track, he draws a crowd. Adam loves photography, and making fun of JQ. Occasionally the two meet, as seen below in the most famous image of Adam, maybe ever. This classic image is of course making fun of the fact that for years, the only products that JQProducts had, was stickers and t-shirts, and we didn't really have many of them either. It seemed to be a never ending struggle. Obviously a great topic to make fun of.